Note: I experimented with a LOT of different setups here all using the HP bios tools, i wont go into what i couldn’t get working, i will just point you to what i have working now. 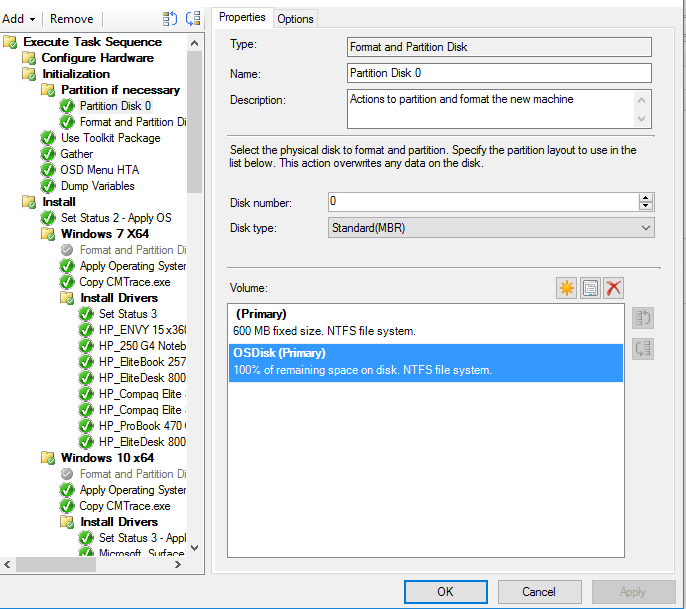 The below step will temporarily set the bios password, configure the BIOS including TPM and then remove the temporary BIOS password. To complete the next step, you will need to gather some files, to download all the required HP Files, see my onedrive share here . 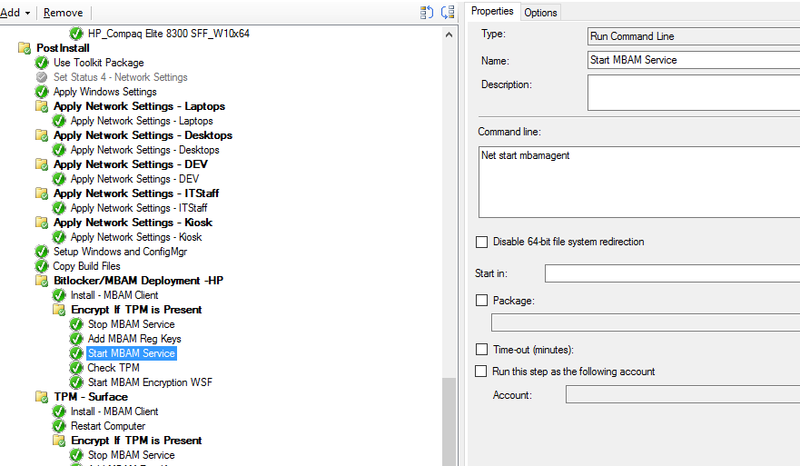 Once you have the files, place them on your SCCM server, create a package (not application) named HP Bios Tools and point the source files to your freshly copied file source, you do not need to create a program for this step. First we need to configure the machine’s bios and enable the TPM Chip. I have noticed that i needed to create different versions of the REPSET (settings) files for multiple models because if you try and switch on a setting that doesn’t exist, it will break. 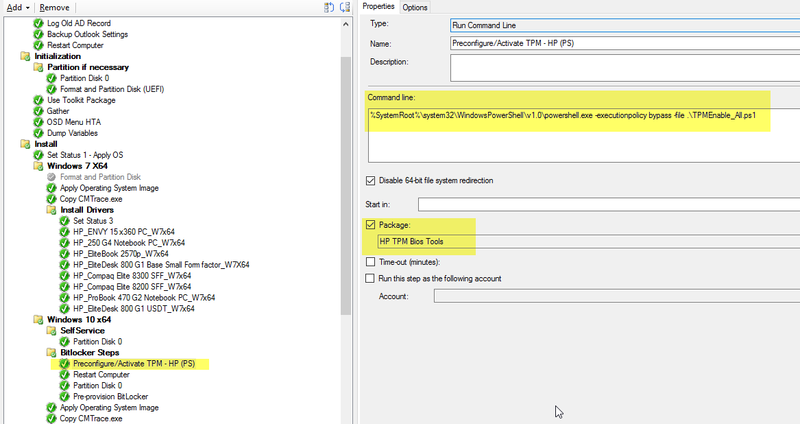 Therefore i put together this simple powershell script will apply the correct settings file for its model. 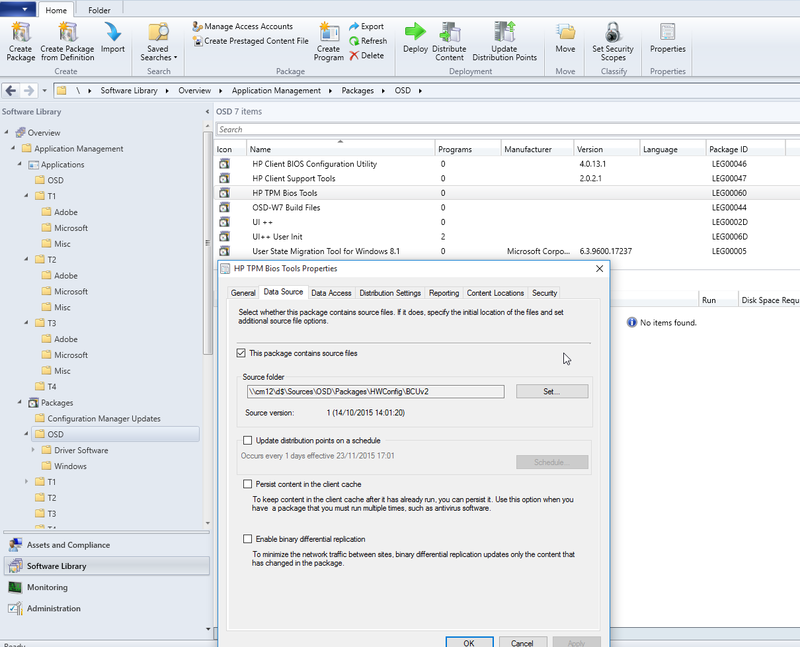 The following TS Tree will only apply to Laptops with the manufacturer of HP , because i am using MDT Integration in my TS i can utilise the “ZTIGather” variable of “ISLaptop” – If you dont use MDT you could just run a WMI query to detect chassis type, ram type or battery presence. For surfaces you do not need to enable TPM as it is “always on” therefore there is no need for that step. Thanks Dan…How did this work on the Surface Pro 3's? 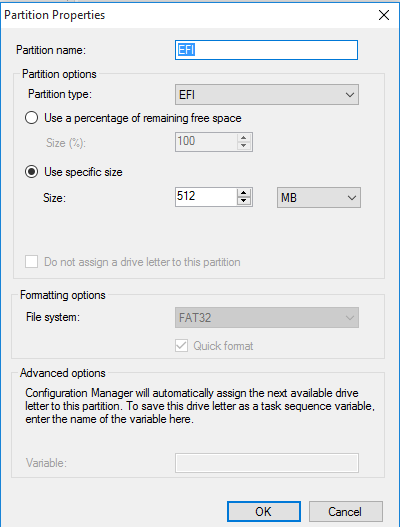 Steps for surface are the same you need to use uefi partition step, are you having trouble ? Will this work the same for Windows 8.1 please? Sure will. Let me know if u haven't issues. Have you confirmed that your TPM chip is being enabled correctly? Check your bios to ensure that tpm is on and active, and managed by OS. Failed to run the action: Start MBAM Encryption Script. This only appears to affect Windows 8.1 because our Windows 10 task sequence enables BitLocker (MBAM) fine. 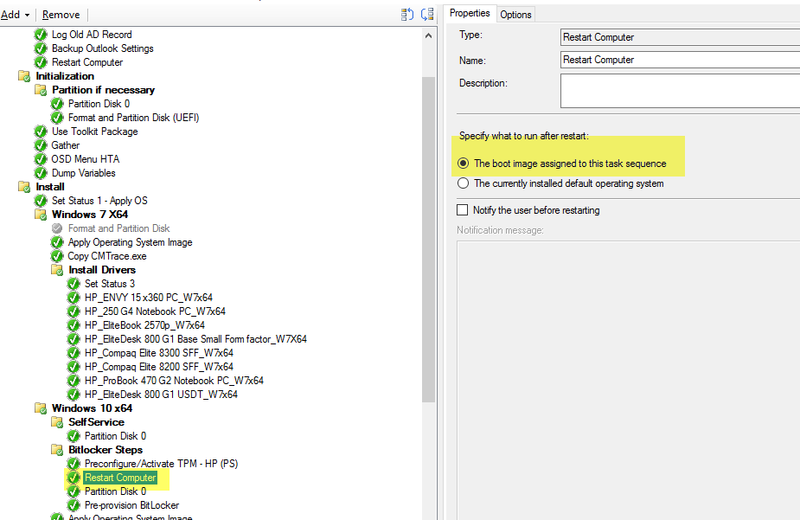 Does this help identify the root cause of the problem in the Windows 8.1 task sequence please? Hi mate , was this meant for scott above ? I assume this is because I do not have the step that says Copy Build Files like you do before starting this. I do have a use toolkit package step but that doesnt seem to solve it. What is contained inside the Copy Build Files step? Do I need add this script to my package? 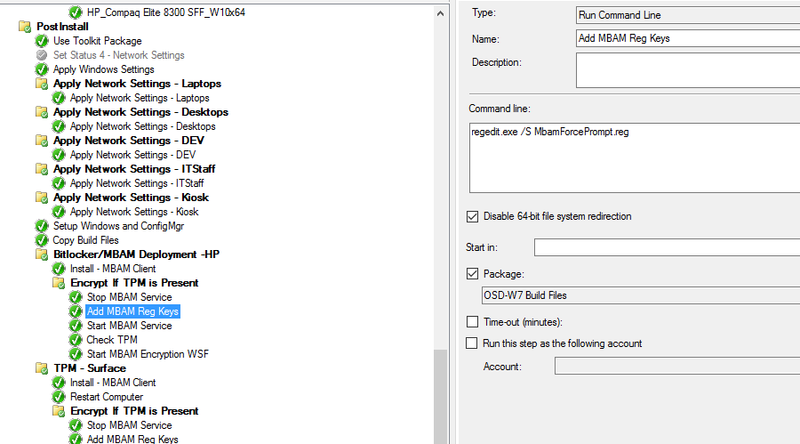 My build files step has lots of files i use during OSD including these two. as long as these two files are in the same package/source you should be fine. Yes using AD is the default method. MBAM has more advantages though. Immediately after running the powershell script “TPMEnable_All.ps1”, the PC then reboots, and boots into this error. I haven't pulled logs yet because at this point in time, the boot mgr error is outside of the PE, so I'll have to pull logs right before rebooting. Interesting, hit me up on Slack about this. Nice post. I learn something more challenging on different blogs everyday. It will always be stimulating to read content from other writers and practice a little something from their store. I’d prefer to use some with the content on my blog whether you don’t mind. I’ll give you a link on your web blog. I recently came to know about http://machinesuae.com/, their Laptops and Tablets are very effective. Laptops and Tablets Thanks for sharing. Thanks for this post so much detail and presented well. Microsoft can take a cue from this ( one day may be). Is your set up mbam 2.0 or 2.5? We have a MBAM set up (2.0) and we want to deploy win 10 1607. 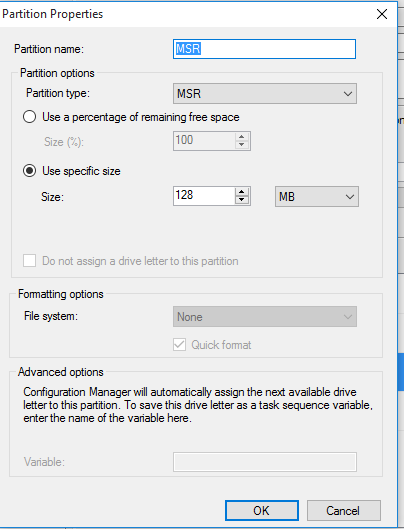 The OS drive encryption works, but not the data drive which is just another partition of the same disk which users are given access to store their personal data. 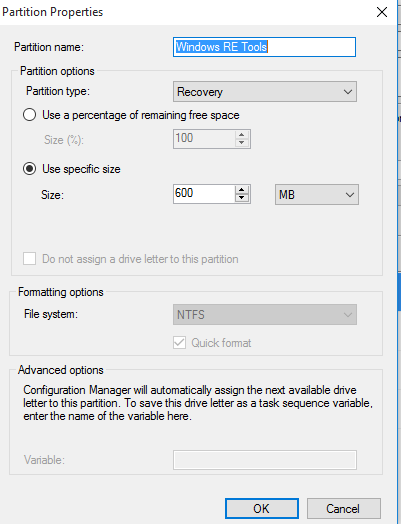 Same sequence of steps work for both OS drive ad data drive on win 7. Would you hazard a guess as to what the issue might be ? Thanks again. 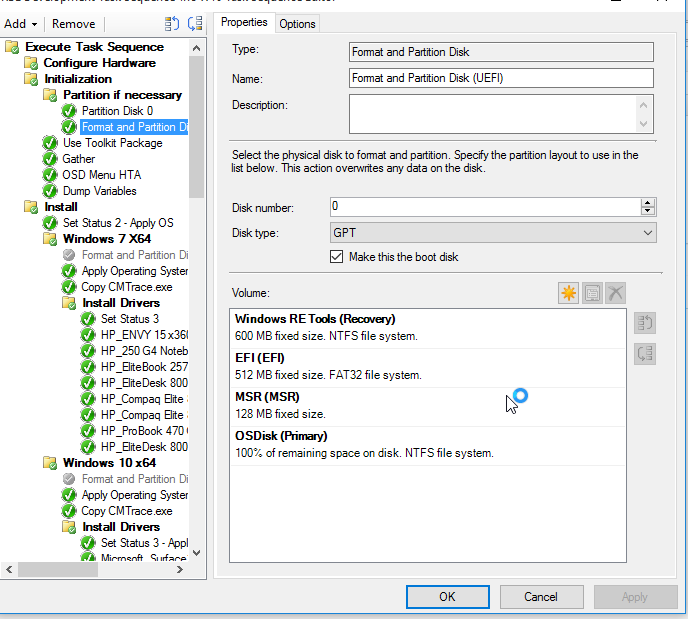 The above steps helps me to find out in detail about window sequence bitlocker. Thanks admin for sharing this stuff. Hope lot more will come soon like this one. great post – but could you advise/highlight at what point the Laptop is added into AD as part of the Task Sequence? so that the recovery info is stored in AD. Also yes we will require a Bitlocker PIN code password – I assume this is entered by the end-user themselves manually. This guide is for storing keys in MBAM, you can use the built in step in the TS to save the keys to AD if you choose. 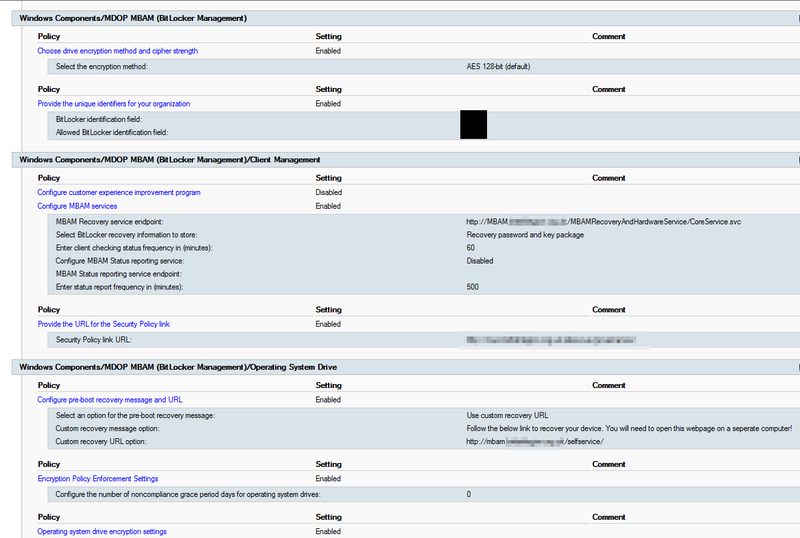 Apply Network setting step is where you configure domain join. Setup Windows and ConfiMgr will join the machine to the domain. use the add>Disks>enable bitlocker step if you want to store keys in AD. 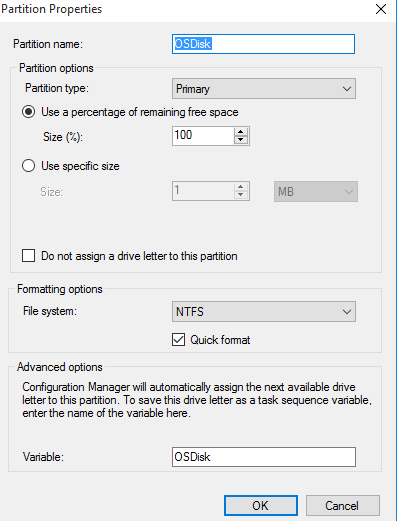 Am I correct in assuming that the partition disk step before the pre-provision bitlocker step is done with a regular BIOS boot because you are only using two partitions and a standard MBR disk. 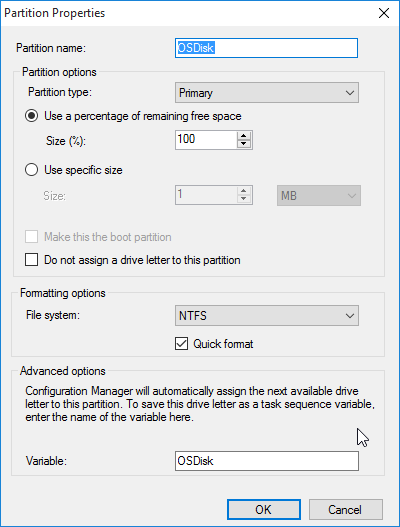 I expected the disk partition steps to be UEFI since most Windows 10 capable hardware nowadays is UEFI and you used a UEFI partition example in a previous part of your task sequence. Do you also have a guide on how to install MBAM or a usable link. 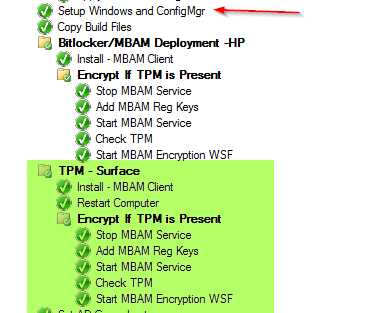 We are now storing the Bitlocker keys in AD but we want to switch to MBAM. Thanks for the great articles btw. 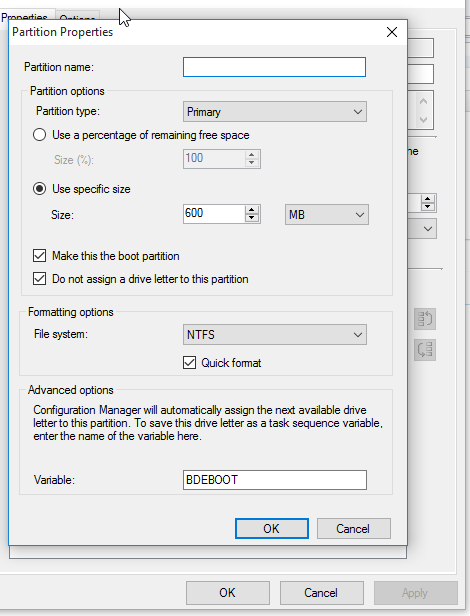 The partition steps shown are both UEFI and BIOS. You should be using UEFI going forward to support features such as device guard, secure boot, credential guard. Super cool tutorial Dan! Thanks for this! 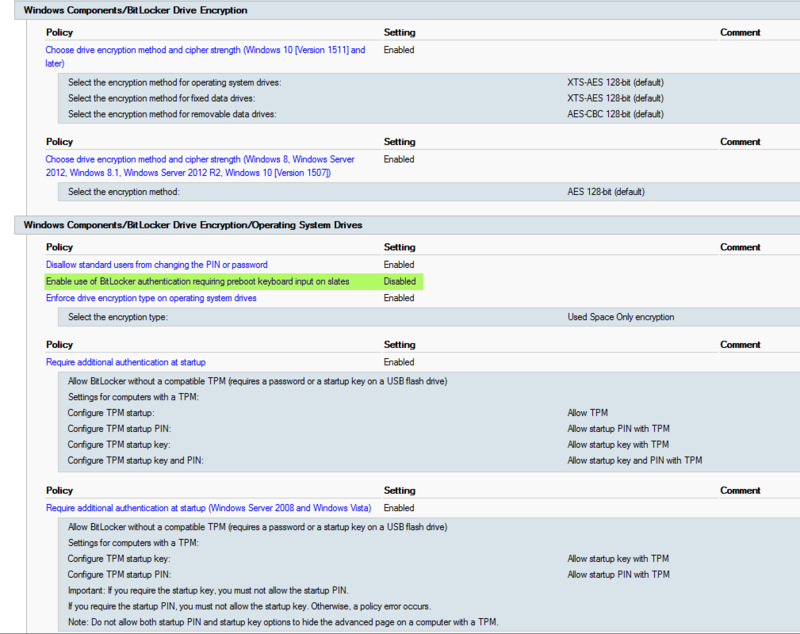 We are in a phase of migrating from W7 to W10 (1803) and security wants to enable bitlocker. 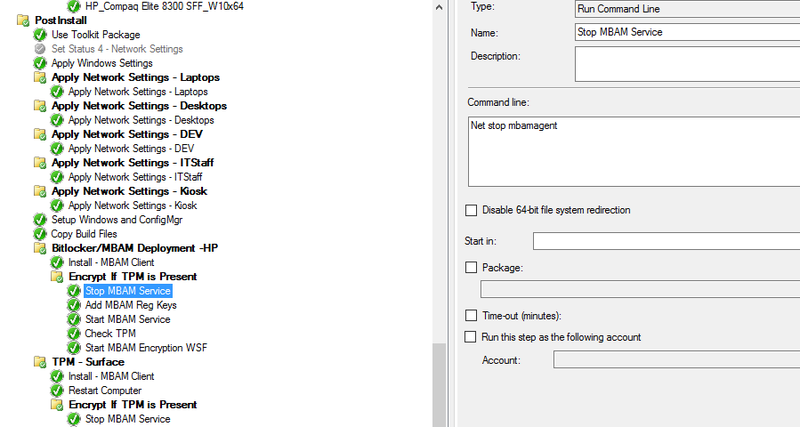 We don’t have a MBAM server yet but beside that we have mainly Lenovo machines and are also moving to HP so this tutorial comes in handy 😉 Do you have any clue how we can handle Lenovo bios to enable TPM chip?